When I first started this class I was not really sure what to expect. The people I knew that were science majors said I would hate it because we look at science in a different way, in a way that is not formulas, equations and laws. Those that were in middle years and took it before me said I would appreciate it, because it would be my easy class since most of the marks came from simple assignments and those that knew me before I started university thought I would love it because I was so involved with the Craik Sustainable Living Project back home. The truth is it was not one of these things is how I think of the class now. Yes, I do hate that it is not traditional science with formulas, equations and laws but that is because it is not a traditional science class. In all of the chemistry classes that I took in my first two years, they cared more about what the answer was and how you got to the answer than why it was the answer, sure they would ask you to justify your answer with laws and rules but I never learnt why it effected me, and what it had to do with teaching students high school science. 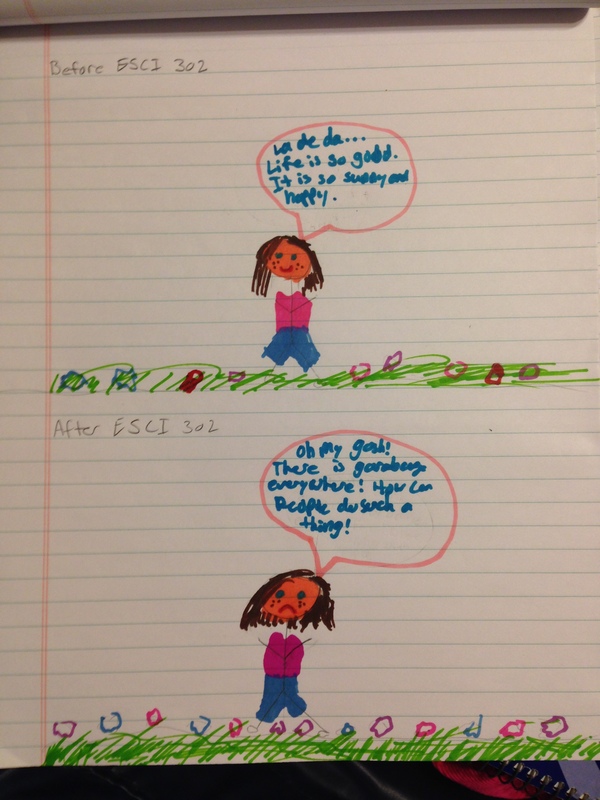 ESCI 302 however has taught me the why, and the how and explained why it matters to me as well as shown me how to make it matter to my students. I definitely do not consider it my easy class, because for me it involves stretching my understanding of learning and science in a way that is difficult for me to take in quickly. for many of the readings I have actually had to reread multiple times to understand and this is not the norm for me and because of this I found the class difficult. For anyone that knows me now, I have a strong negative opinions about the Craik Sustainable Living Project and this create a bias opinion of many things that we discuss in class so I did not love it for that reason. The truth is that I don’t hate, love or find the class easy. It is a class just like every other class I have taken since starting University, I worked hard at it but likely won’t have got the information that the class intended me to get from it. Will I make an effort to have my students outside, probably but not because I think they all will suddenly become obsessed with the environment but I want them to respect the environment, to understand its value. My drawing below shows how I looked at Earth before and after I took this class and in a way this is what I want my future students to understand from my teaching, that all time is the right time to pick up garbage, to throw their own garage in the trash can rather than on the ground. I still don’t know how I feel about this class, but I do know that I have learned a lot from this class, stuff that I will be able to apply to my future students and that is something that I can’t say for most of my previous science classes. In my Epsy 217 I have been working on an inquiry project that involves using Indigenous education as a tool in school rather than as a topic on its own, one of my sections is dedicated to integrate indigenous ways of knowing into science class. One of the ways this is done best is by using the Medicine wheel. 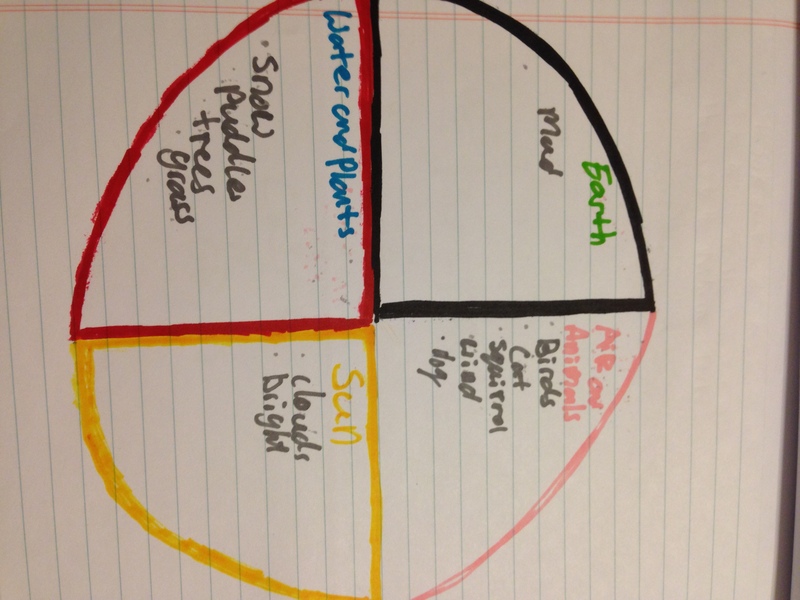 The medicine wheel has many different uses but the ones that relate best to environmental science are the components of nature, such as animals, plants, water, air, the sun and earth. I spent some time over the break looking outside (i refused to go outside in the cold, because i HATE the cold) and decided to put the things that I seen from the window into the Medicine wheel in the proper areas of the circle. It surprised me when I noticed the grass because of all the snow we had gotten a during the break, but because of the way the wind was blowing it managed to create a patch of grass in the ditch. Something that I heard a lot in my classes last year (which were mostly chem and math classes) was that nothing related to First Nations ever truly related to science or math because the answer will be the answer regardless of what you believe, and in a way this is true. The answer of a question will remain the same, but the steps that you take to get there, or the things that you learn from a lesson can vary depending on how you look at the information. One person can see a patch of grass in the snow and come up with an explanation of wind trajectories and angles while another person can see the same patch as think that it was left empty because the creator chose to allow a patch of grass to remain to remind people that spring is coming, even though the weather has been horrible. Using different ways to think about the same thing really opens my eyes to all the different ways of knowing and understanding that we could be teaching in schools, rather than just the western way. I chose to watch the documentary “Living on One Dollar”, where four college students go to rural Guatemala for two months where they could only live on $1 american dollar a day. The four boys had to learn to deal with daily hunger, illness, and budgeting without a secure amount of money. By the end of the film the boys learned that even though the people in Guatemala are struggling with extreme poverty they have found many ways to work together to make their standard of living more manageable to them. The target audience is the average middle class person that feels the need to help. This would be a great video to show in a classroom because it would provide the students with a chance to create their own possible strategies to help with poverty. The filmmakers did a great job at capturing how much poverty impacts the people of Guatemala. The ALP topic that I was researching and learning about was overpopulation, and while 1.1 billion people were living in poverty at the time of the filming (2013) that number is increasingly growing as our population grows. In under developed countries is where population growth is most severe and where poverty is at the highest level. The more overpopulated the world becomes, the more people there are living in poverty. The film showed many strong examples of children that were unable to receive education because their family could not afford the cost of books and supplies plus they depend on their children to work in order to make enough money for their family. At one point the film students, who had no background in international development and were unable to communicate in Spanish, made a comment that it would not be that hard to live in poverty for a few years, and this was frustrating to hear. These people do not get to only experience poverty for a few years, in many cases they will never escape poverty, it is not something that they have a choice in, and from people that come from privileged, or middle class at the very least it was hard to hear. The filmmakers showed a lot of examples of how poor communities can work together to make money, but also how we can do simple things to help those in less than ideal circumstances, even basic things like donating only school material that we no longer need to make school cheaper for the families. Education is the key to eliminating poverty; the more educated people are the more likely they can find a job, which will help them slowly come out of poverty by helping them have a more stable access to food, shelter and health care. When looking through the possible writing prompts that we created in class I really got thinking about subjects that would be hard to have the environment integrated into, I actually did not think that there would be a class where it would be hard to use the environment as a tool for learning. Normally I would have said math, but the group that presented about disconnection on March 3rd had already eliminated that thought. I started with the Grade 5 curriculum, I than glanced through the different subjects; using the environment in Art and ELA is something that seemed fairly basic but I got stuck on Health. To me the basic idea of being healthy involves going outside but I briefly remember that in Grade 5 my class talked about self-esteem, body image and healthy relationships so I decided to look more into these outcomes to integrate the environment into. The exact outcome that I am going to focus on is USC5.4 ” Analyze the connections between personal identity and personal well-being, and establish strategies to develop and support a positive self-image.” In class we have talked a lot about how important understanding stillness, and getting fresh air is to a person’s life, allowing a person to feel refreshed as well as clear their mind. Thinking about your personal identity, personal well-being and supporting a positive self-image are all super important, especially when you are in your ‘preteens’ because that is when you are most vulnerable to developing poor self-esteem (at least in my opinion). I would want my students to have a long amount of time to develop an understanding and connections between their personal identity and personal well-being, rather then them have a group discussion about these things I would have them create a journal that they would write in once a week (or more depending on how often the class is), during class time for 15 minutes. At the beginning of the year they would chose their own personal spot, away from everyone else, where they would go to for every journal time (the winter may be more difficult). In this time there would be prompts that they would have to use as guidelines as to who they are or what something means to them. An example of this would be having them look around for a few minutes to pick out a colour that relates to or has meaning to them, it is extremely basic but can go lots of places. By having them do something simple and then connect it to who they are, or what makes them happy it will allow them to really think about themselves in a positive manner. In grade 5 kids still have a good imagination and a good understanding of who they are, but I recall this as being when I started to believe that I had to act, look or think as my friends did. A journal creates a safe place to express your thoughts and by writing outside, it is easier to clear your mind from the everyday distractions of school. In my journal I did my own version of “pick a colour, how does it connect to you and what does this mean” and since the weather has been so nice I even did it outside. When I started this class I was really excited about two things, one is that I would get to expand on my teaching strategies and second is that it would be nothing like Geography 12o that I suffered through last semester. I have learned that while I am getting a better grasp on how to teach environmental science but the stuff that I learned from geography 120 plays a much larger role in my understanding of the class than I realized it would. On my first entry I talked about my hometown and Brandon commented wondering what the trees on the side of the highway were there for. It took me a really long time, actually it took me until I went back to Craik this weekend to figure out what trees he was talking about. I grade 4 or 5 my town started this project called the eco village. One of the first things they did with this project is they planted over 100 trees in an empty field, these trees are specially designed to grow for 25 years than are meant to be chopped down and used for paper, but once we chop them down than we plant new ones in their place. The reason it took me so long to figure out what trees he was referring to was not because I was unaware of them but because as a person from the town I know how much of a fail this project was. Yes we have lots of trees that are growing, but originally we had five fields, and every five years we would plant 100+ more trees, and keep this pattern going so that in the time it took to grow the trees to their maximum other trees would be in different stages. However, after the first three years some major flaws were discovered, the trees started so small that weeds could kill them, so we would need people to weed the field every week. The towns solution to this is have the elementary students go out in the afternoon every Monday and weed for 1.5 hours. The parents were outraged by this, it did not matter what the weather was like in the spring, the teachers would make us go out there, and we would lose a lot of time in the classroom. This caused all classes to be really behind, and it was especially hard to want to want students weeding when the people of the community that thought this was a great idea would not come out and help. Another major problem is that the trees attracted wildlife, a lot of wildlife, deer and moose especially. This increased car accidents, in the fourth year of having the trees, when they finally were able to provide shelter for animals there was over thirty animal related car accidents on the number 11 highway. These animals did not like staying in the trees and soon we had large animals roaming the streets of Craik. When Brandon mentioned these trees and I actually figured out what he was talking about I was actually upset, not at Brandon but at how much frustration the trees have caused my town. It reminded me of how something with good intentions has many impacts that are not good. I wonder about how many times people came of with a new idea and thought about how great it would be for all people but now we are realizing that it is creating more problems than solutions, for examples plastics or synthetic material that makes our lives easier short term but not long term. Some of the things that come up in class are topics that I am not sure about, when I was reading about leverage points, something I kept wondering about was, but do these actually work. I don’t believe my question was ever really answered, I don’t even know if there is an answer to this question. How do you know if they work, it isn’t something you would see instantaneously, and it would be hard to prove that a lot of change has taken place because when you look for change over a long period of time, something will have changed but it is hard to know how much has really changed and if it changed in the way it was originally intended. This is something that I am accepting, the things I do now make result in a change but it is unlikely to be a change I will witness. Our last assignment was about reflecting on eco literacy, this was something that I found challenging because there is noway to rate how eco literate you are. Every person has a different understanding of what it means to be eco literate and those differences are what makes it difficult to come up with a solution to environmental issues. Something that I was began to realize is that there is no clear solution to any environmental problem because there is no one cause. I have started to gain a better understanding of what it means to be Eco Literate, as well as a better understanding of how to teach environmental science but I have not fully figured out how I want to go about making my students eco literate. I know that young students want to help, it is just figuring out a way for them to help without them feeling overwhelmed or defeated when they do not see results. When I was writing my poem I found that it was both easy and hard at the same time. It was easy to put the words together once I knew what I wanted to say but figuring out what I wanted to say, what truly matters to me as an eco literate person. But I am not an overly eco literate person, I know that it is important to preserve the environment for future generations but it is hard to believe that every piece of garbage matters, when considering a lot of garbage I can see how it matters but unless I see a lot of garbage in one place I never really think about the impact that it has on the environment. When I was reading some of the other eco literacy poems/letters I noticed how many people connected with recycling and picking up garbage, as if some how this is enough. Maybe it is possible that if all of society recycles and garbage is properly disposed of than it will make a difference but that is not going to happen in my lifetime because too many people do not care. If people really cared about the garbage and recycling than it would be much easier to find a garbage can on the streets, it would be come law that large buildings must take part in recycling. Did you know that the university does not actually recycle, many student groups will have their own recycling in their lounges and use the money to help cover costs, and URSU has a small recycling program but the university as a whole does not have a recycling program because “it is too much work to organize”. When you think about how many bottles students throw out each day that is alarming, but than you think about how if the big places don’t need to recycle why should each individual person spend their time sorting plastics, it makes it hard to convince others that it matters when one person does not make a difference. Willow’s showed a different look on how eco literacy is important from an animal’s perspective and how while her dog does not care about recycling, he does care about having a healthy environment to play in, which provided me with some reasoning as to why that one person does make a difference. A dog only needs so much area to play, but in the area that they play anything in the area is either considered a toy or food. Thinking about how bad it is if a dog tries to eat a piece of garbage make more understandable as to why the one person that needs to pick garbage. Something I really focused on is how the world is not going to survive if we keep treating it them same way, but nothing I said provided any solutions, just stated the problems and possible results of our actions. Nat shows how the beauty of the world is so important, that by noticing it you want to make sure it remains healthy and beautiful, but does not focus on the problems of the world. None of us wrote the exact same thing and we all had different understandings of what it means to be eco literate but we all had one thing in common, we all understand that something must be done to allow the earth to remain healthy and stable. When it blows garbage around? What happens when there is more trash in the ocean than fish? Or when our non-renewable resources run out ? How quickly will our society panic when we can’t breathe easy a night? Or can’t buy fresh fruit at the market? Our world will panic and people will ask why. Not daring to recycle, renew, reuse. Why were people not understanding that Earth is not unlimited? How could people have done anything different? The politicians were too concerned about votes to listen to the people. And the scientists were too frustrated with society to care. Why are we waiting till it is too late? Garbage in any direction it chooses? Growing up in rural Saskatchewan it is hard to believe that our world is densely populated, or that Earth is at risk of being over populated. The more I learn about over population, the more I think that it is not that the Earth is overpopulated, it is that so many areas are overpopulated and many areas are underpopulated, People do not want to live in rural communities, they are not nearly as convenient as urban areas, there is no such thing as a 3 am McDonalds run, or multiple schools to chose from so this deters many people from wanting to live in rural settings. I understand it, those that are coming from other countries are not always wealthy and are unable to get high paying jobs but in a city they have more options. You can rent a house or apartment, there is more than one place to work and you can take the bus everywhere. Small towns do not have these options, owning a vehicle in a small town is essential, most people don’t rent because houses are much cheaper in rural areas than cities and there are no apartments because there are not enough people for them to be profitable. While small towns are becoming smaller in population, cities are becoming more crowded and expanding even more. Last semester I took a Geography 120 class, one of the topics was on overpopulation and how it will impact the environment. There were two different models for us to learn, one was referred to a the J-Shape, which stated our population would continue to grow until it reach the environmental limited, which is when disease, famine, and war would rise creating a severe decrease in population. The other option was much happier, it was referred to as the S-Shape, which stated the population would grow until it reached its environmental limit, and than due to technological advances the environment limited would increase allowing for more population to survive off of our resources. I think it will be a combination of both, people are greedy, not all people but enough people that they make a major impact. No matter how high the environmental limit is I think we will eventually reach it if society keeps behaving in a way that makes all resources seem renewable and expendable. For something to change it needs to be more than the politicians making the rules, scientists, and the general public need to have some say and need to be aware of the impacts they are having. People have a tendency to chose to ignore things that they don’t want to hear about, but if we make it so that the problems are heard everywhere people might being to be more aware and start to think about the changes they can do, As for overpopulation, I think that it is only part of the problem but it’s one that needs to be solved with technology not with laws banning reproducing or child maximums. In my journal I drew a picture of a tree. When I think of all the nature in the world, I think about how vital it is to the survival of humans. Plants are able to convert Carbon dioxide (what humans and animals breathe out) into Oxygen (what humans and animals need to breathe to survive), which is why a tree is my focal point of this week’s journal. One of the articles that we had to read was called Breath of Life, Sustainable Living, and Ecological Literacy had many key words that I have chosen to focus on. Atmosphere is the biggest word on my page, this is because all life forms on Earth are found within the atmosphere, AIR is also large because all things in nature need air to survive. I included the quote “Temporary stress is essential to life” because the author doesn’t seem to define what temporary is, at what point is too much stress or too little stress? How can there be a thing as too little stress? The world is a lot more than a billion years old so maybe the stress that we are currently putting on it is only temporary, if stress is needed for life than is it possible that everyone is overreacting on the climate change. Things need to change in order for life to happen, Change happens everyday, the Earth is constantly changing, maybe humans are just a catalyst to the change that is inevitable. I have always have nature as part of my life, but most of it is artificial nature. In the Spring farmers are seeding and I work in the greenhouse. Both of these jobs are important to my community, the farmers make up for more than half the town and more than half the students at our school. The greenhouse supplies jobs to many people in town, as well as provides the plants and seeds for gardens, it is much easier to make a trip down the street for gardening stuff than to the city when you are in the middle of farming season. While both the plants and the crops make for nice scenery, they are hardly natural but more so an essential part of human survival. Even though the crops and greenhouse plants are not purely natural, there are still plants that convert CO2 into oxygen which make them important, just like the trees that grow in the wild.